Keep it outside. Propane is a highly flammable gas. If you store a tank in your garage and it has even the smallest leak, the spark of starting a car or lawn mower could cause a fire that results in a need for fire damage restoration. Keep it in the shade. While your tank should not be stored indoors, it should also not be stored in direct sunlight. On a hot sunny day, the temperature of a tank that’s not properly stored could quickly go above 120°F. The hotter your tank gets, the greater the pressure will be inside the tank. Portable propane tanks are equipped with a relief valve that activates when internal pressure builds up. Once the valve releases, the gas will slowly dissipate through the valve into the air and could ignite. Keep it upright. If the valve on the top of the tank is at all compromised, gas can leak out if the tank is left on its side for any length of time. Keeping your tank stored in a safe place where it won’t get knocked over will help ensure that spilled gas won’t accidentally ignite, causing fire damage to your home that might require the services of a fire restoration company. Store at a safe distance. If you have backup tanks, don’t store them adjacent to each other or right next to the grill. A distance of at least ten feet should be maintained between propane tanks as well as any other potentially flammable or spark-causing object. Keep the valve closed. Make sure the valve is tightly closed when you’re not using the grill. It’s always best to close the valve first and then turn the burners off, to allow excess gas to clear the lines. If you smell gas when you approach your grill, don’t use it until you’ve had your tank checked. Don’t use a damaged tank. If your tank has dents, peeling paint or rust, don’t use it. The integrity of the tank may be compromised, and gas could potentially be leaking. Take care when you’re transporting your tanks to and from the store. They should be kept upright and stable. By placing them in crates, they won’t roll around or collide. Fire safety, both indoors and outdoors, is a priority in every season. Your entire family should be familiar with fire safety practices and know what to do in the case of an unexpected fire. 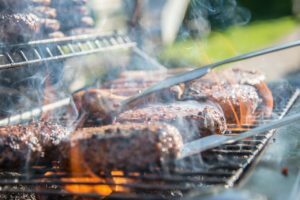 And, it only takes a few minutes to implement these quick fire safety tips to ensure that your summer cookout season is filled with only happy memories of delicious food, great company and family fun. Happy grilling! While we hope that you never need our fire restoration services, we know the stress and mess that can be caused by fire damage. It’s good to know that the team of certified and trained fire restoration experts at Hays + Sons are just a phone call away, 24 hours a day, 7 days a week, 365 days a year. With 140 employees, 120 vehicles, and eight separate locations, Hays + Sons has you covered.